WØEA Blog! 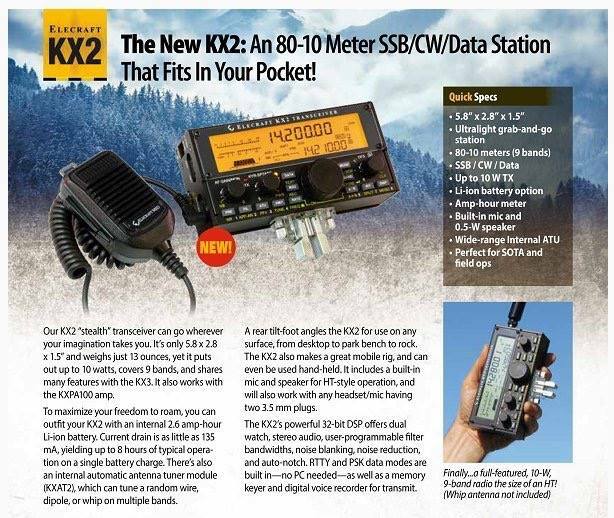 : Elecraft KX2: The end of kits for Elecraft? UPDATE: WITH VIDEO! Elecraft KX2: The end of kits for Elecraft? UPDATE: WITH VIDEO! Elecraft has always offered kit versions of just about everything they make, until now. The newly announced KX2 (not a successor to the KX3 or the K2 interestingly) is their first offering to come in factory built ONLY. Expected to be priced at about $750, it seems they will be targeting the more mainstream ham market. I'm sure they'll get a lot of gruff for leaving out 6m or 160m but I think those are reasonable to leave out. The idea of a rechargeable lithium option sure sounds nice too. Maybe this is the secondary radio I would want from Elecraft - something I won't ever use on my desk but is destined to be carried in the field. At the $750 price tag, that option seems far more likely than it did with the KX3 at nearly 2x the cost. We will see how it compares from a performance standpoint though if you're comparing it to just about any other radio (save KX3) it doesn't need to be a stunner in the RX department to be a winner. I'm going to be keeping my eyes out for more details, so be sure to check back!